Some artists do such amazing things with their materials, it almost seems as if those things were invented just for them. Such is the feeling of awe one gets when seeing the designs by Hungary’s Angie Mézes, of Red Tulip Design. 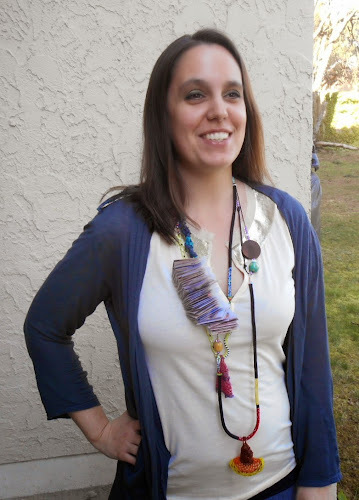 Her combinations of beads, cabochons and ribbon are exquisite, with beautiful colors and organic flowing shapes. Angie: I've always been a creative person, creating new things is very important for me. Before I started with beading I had decorated my home, boxes, mirrors, candlesticks etc. with different techniques. Five years ago I felt in love with beaded beads. I found information on the internet about how-to-do-it and I was very proud of my first (not so perfect) ones. I made a lot of jewels with beaded beads and peyote techniques. Then two years ago I fell in love with bead embroidery and it became my main and the most beloved technique. Angie: My first jewels were beaded earrings. Some of them were sold, some of them were Christmas gift for my friends. 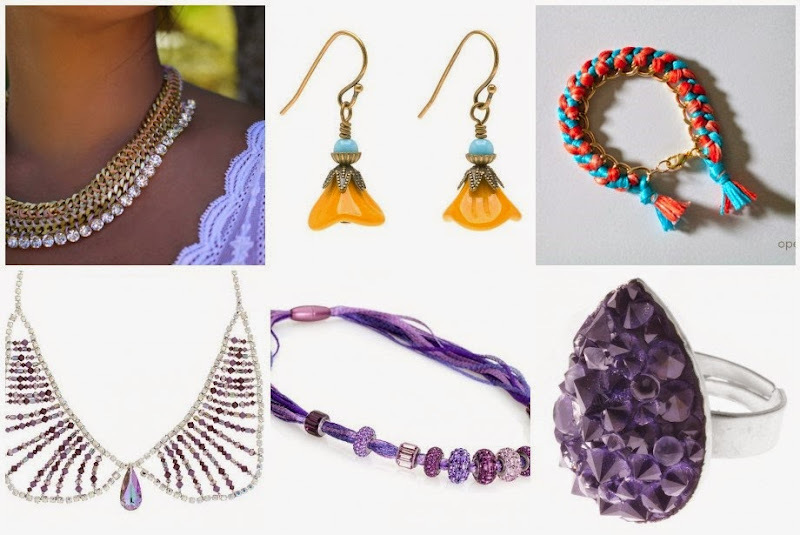 Angie: I'm a big fan of gemstone cabochons and beads (and I collect gemstone elephants). 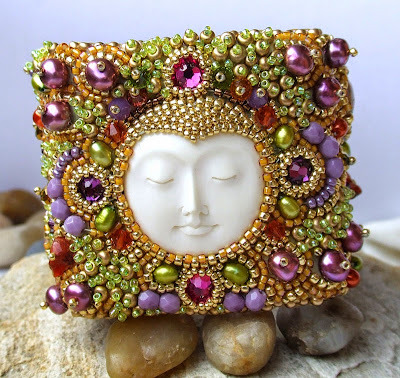 I often use gold Japanese seed beads, carved bone cabochons, Swarovski crystals, freshwater pearls, metal buttons. My new passion is the shibori silk ribbon. Angie: Nature is the most important inspiration and as I have two little sons, we paint funny things and we play a lot with polymer clays or with my bigger beads and gemstones. While playing I see the shapes and colors and they start to form new jewels in my mind. They're just like a movie in my brain. The hardest part is to wait patiently till I can sit down to my desk and start to materialize them. Although I'd gave up being a teacher for History and German, I still love different cultures, fine arts and my favorites are the ancient Egypt, the Renaissance, the art of Gustav Klimt. Angie: I don't make plans about my jewels, I let my instincts to guide my needle. My mind is full of beading themes, I often dream about beads and jewels. I'm fascinated by colors and textures, they are the most interesting aspects for me. The life with two little children is never simple and never boring but I think I'm a person with inner harmony and I hope you can see this harmony in my jewels which are parts of me. Angie: Gold, fuchsia, turquoise, purple and orange are my favorite colors, but I love the color palette of the forest in autumn. Angie: I love to find new ways for myself, I'm looking for new challenges. Creating soutache jewels is a great adventure for me and I have a lot of plans with polymer clay for the future. Angie: My bracelets made with shibori silk ribbons became the most popular items. 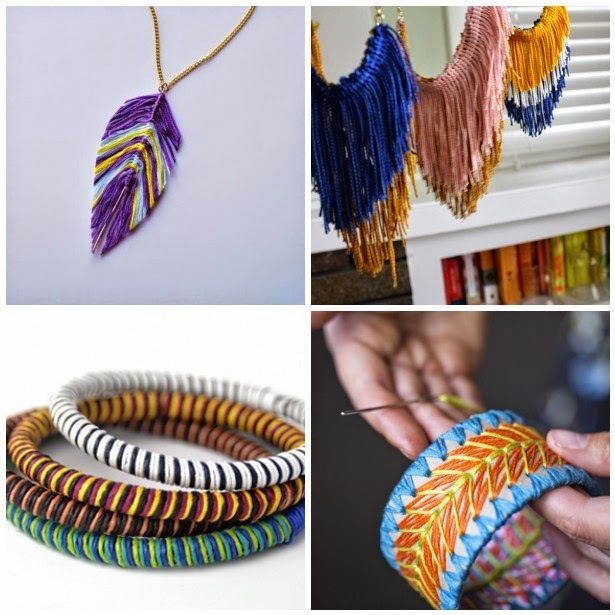 I also offer shibori bracelet beading patterns and DIY kits in my shop. They are unique because of their color palettes and the exciting design. „Perfection in wearable art” is one of the customers' feedbacks for my shibori bracelets. Angie: I started to offer the DIY kits to share the feeling of creating those bracelets with the ones who fall in love with my beadwork. I would like to make people happy with my jewels: I hope my jewels become little treasures in the life of my customers. Positive feedbacks and comments from beading pals and artists are super. You can see more of Angie’s gorgeous work in her Etsy shop, or purchase her hand-picked materials at Red Tulip Beads. For even more embroidered treats, follow Red Tulip Design on Facebook and Pinterest. 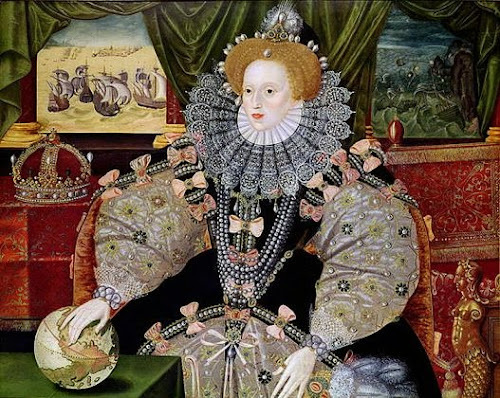 Nobody does lavish jewelry quite like royalty, and Queen Elizabeth in particular took personal adornment and fashion to a whole new level. 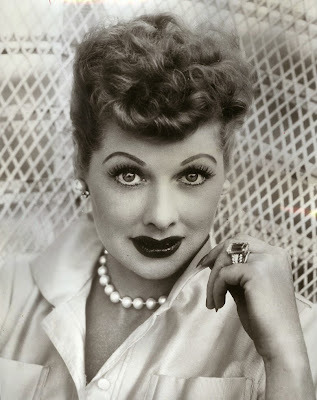 Her many portraits provide an amazing look at jewelry trends of the time, which included an awful lot of pearls. The love of pearls likely comes from the recently thriving freshwater pearl industry of the area. Scottish pearls were abundant and a valuable commodity at the time. 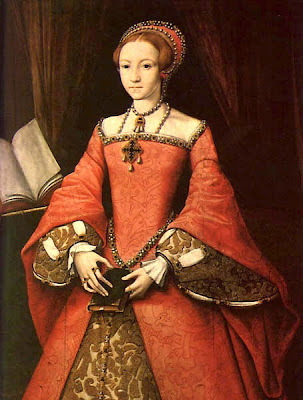 Even in her youth, Princess Elizabeth is seen in portraits wearing her mother’s pearls – Anne Boleyn’s famous initial pendants. What’s your favorite type of pearl bead? At last I have a project in progress that isn’t too secret to share! This week I’m taking a quick break from my big project to make a necklace for this year’s Halloween costume, and it’s going to be awesome. I picked up one of the new Swarovski Elements crystal skulls a while back, mostly just so that I could see one up close. I had no idea what I was going to do with it, and it’s been sitting in my glass bead box for ages, not being inspiring. So it was very exciting when I decided to go as a lich for Halloween this year, and needed something spooky to make a pendant with. What better jewel to hold a sorcerer’s soul than a crystal skull? I’m making a short chain with red-trimmed St. Petersburg stitch. I want the necklace to fit like a choker, so it’ll be very quick to whip up. So far I’m loving the look of the ruby beads along the edge. They’ll definitely stand out! 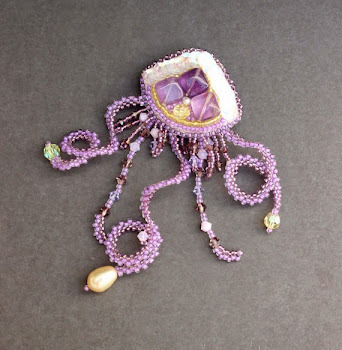 Bead embroidery is one of the most exciting mediums available to bead lovers, simply because it has no limits. 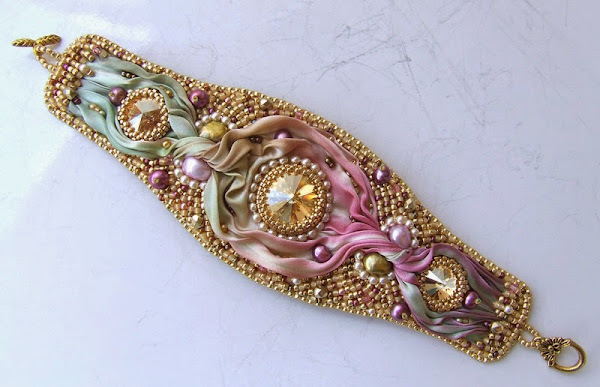 Nearly anything that can be sewn or glued is fair game for bead embroidery: from sequins and cabochons, to ribbon and thrift store treasures. Bead embroidery is also one of the only techniques that moves seamlessly from jewelry to non-wearable designs, décor and sculpture. It is the technique for imaginative beaders. 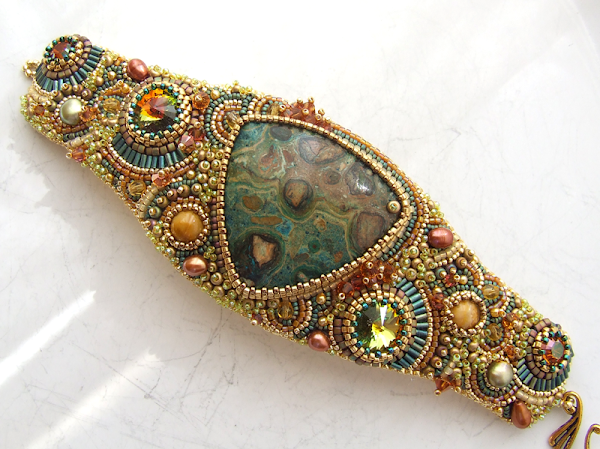 One group that doesn’t shy away from the challenge is the Etsy Bead Embroidery Guild. This team of shop owners is small – with a maximum membership of 50 at any time – yet their designs are anything but. Many members have been honored with awards from some prestigious competitions, and been featured in popular beading magazines. Here are just a few of their recent creations. The Guild currently has 37 very talented members. Search for EBEG on Etsy to see hundreds of gorgeous designs. You can see more finished pieces and collages on the EBEG team Facebook page, or find shops on the Bead Embroidery guild page. 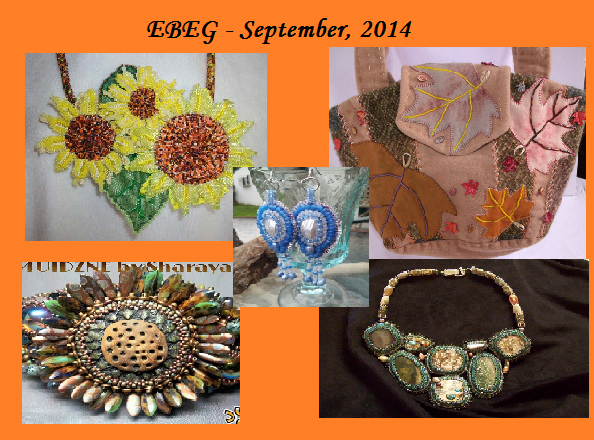 For a serious dose of inspiration, check out their regular Bead Fest group challenges on the EBEG Blog. Another bead giveaway has come to a close. Thank you so much to everyone who entered to win the fall treasures bead mix! This month I asked about your favorite fall colors. Our winner, Estra, chose the combination of brown, orange and yellow. These colors definitely bring to mind the beautiful colors of autumn foliage, fall harvests, and cozy sweaters. so I combined almost every shade of orange, yellow, and purple that I had in my stash. There’s also some aqua blue and a hint of green. I had a lot of fun working out the best pattern for such a large selection of colors. I was really excited to work on this lariat, not only because it was one of my favorite - and proudest - designs. I simply loved the transparent red seed bead mix used in both the rope and the leaves. I think it’s just about time I searched for it again. This pendant was really interesting to make. It combined my love for 15/o bead flowers and 4mm cubes. I want to revisit this design in a more versatile style soon. Do you like making custom designs? What’s your favorite part of the process? My bead tray looks a little chaotic this week as I tackle my new collar project. I’ve included a lot of accents in this design, including African Christmas beads, wood spacers, and two kinds of drops. In addition to my usual votive of culled beads, I’m also collecting up any 11/o Czech seed beads that aren’t wonky, but just a bit too small. They’re not quite right for the beadwork I’m doing now, but they’ll be just fine in other projects. Picking them out and setting them aside saves me from having to encounter them again and again as I work. Between these and the many bead types I have laid out, there were already a lot of saucers to begin with, and then I ended up having to pick out a lot of stitches, adding another dump bin of deleted beads to be reworked. I was on such a roll that I completely forgot to incorporate the second part of my pattern, and didn’t notice until I was almost two thread lengths past where it should have been added. This would have been a tragedy, except that I’ve been taking precautions against just this sort of situation. I’ve gotten into the habit of leaving my tail threads unfinished - just weaving them in a little ways and then leaving them in place until the end of the project. This way, if I catch a mistake, I don’t have to cut any threads - just undo a bit of work and carry on as usual. Have you had any beading mishaps lately? Although I’m taking a little time this month to explore non-traditional color possibilities for fall palettes, it’s always nice to revisit the classics. The warm colors of the fall table, field, or forest are a welcome comfort when the weather turns cold. 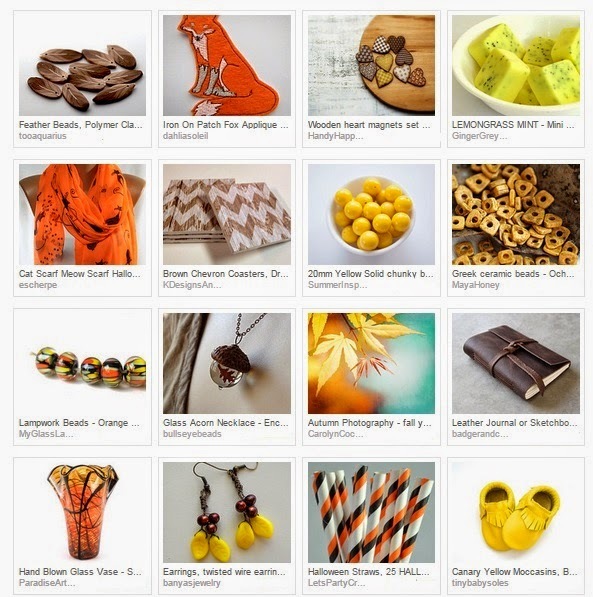 For this month’s bead giveaway, I’ve selected a wonderful trove of fall-worthy vintage acrylic beads. The first bundle includes beads that are about 6 to 14 mm, in a variety of shapes like ovals, tubes, rounds and rondelles. The palette is a gorgeous mixture of brown, amber, peach and terracotta. The second batch features smaller accents from about 2 - 12 mm, with lots of faceted rounds. 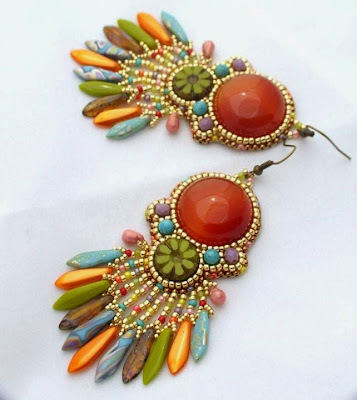 Colors include a wide variety of browns, plus bone, gold, topaz and burgundy. For a chance to win all of the beads shown, leave a comment here on Inspirational Beading and let us know what you favorite fall color is. One lucky winner will be drawn on Monday, October 20th. Important: Comments must be posted directly at InspirationalBeading.Blogspot.com to qualify, but no log-in is required. Please make sure to leave a contact method in your comment if you do not have a profile with a public email address. For security, you can type your email like so: username AT yourmail DOT com. Incomplete or duplicate entries will not be included in the draw. Although the colors that we associate with the seasons are very much ingrained, there can be subtle differences in our ideal palettes, influenced by anything from our childhood experiences to the region in which we live. So although we often think of oranges and yellows as traditional fall colors, it’s certainly not unusual to incorporate greens, purples, and even blues. 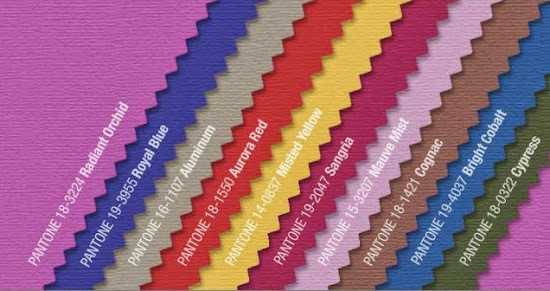 This year, the Pantone fall color line up for women’s fashion is definitely unconventional. 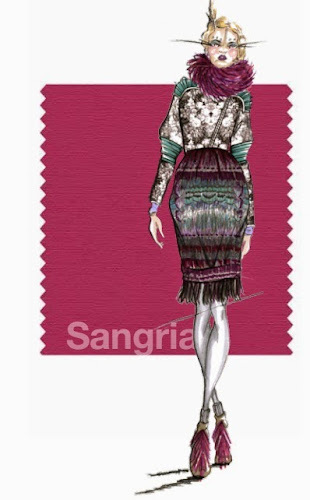 There isn’t a trace of orange at all, and there is an abundance of red and magenta apparent in colors like Aurora, Sangria, Mauve Mist and color of the year, Radiant Orchid. Even the Royal Blue hides a tiny hint of pink. Compare it to the fall palette for 2010, which includes nearly a full rainbow of colors, and this mix looks a little jarring at first. But is it really so strange? In a new seasonal collage series this month, I’m taking on the challenge of mixing Pantone picks into trios that look more traditional than the entire palette at a glance. When mixed in the right proportions, any colors can be made to create a certain look or mood, and I hope to do just that - making fall fashions work with all these pinks and purples. Each collage will feature a fabulous statement necklace as always, and a few choice accessories to help inspire great fall designs. I decided to go with an easy color first, and started my experiment with Misted Yellow, which does look like autumn all on it’s own. After eliminating a few more obvious colors, and ensuring I had enough left over to make two more trios, I finished the palette with Radiant Orchid and Cognac. Then I set out to make purple look at home in October! Finding the right hues wasn’t an easy task. 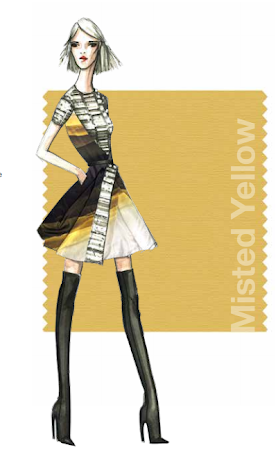 Misted Yellow was particularly tough to match without accidentally going too pastel or beige. Cognac’s soft and chocolaty look was difficult to uncover under mounds of rich leathers and orangey browns. Finally I had some pieces that I was happy with, including a gorgeous statement necklace with metallic purple chain that almost perfectly matches Radiant Orchid. The hints of yellow sealed the deal. Though it doesn’t match in the least, I still couldn’t resist includin a bright yellow bangle, with a dark amethyst druzy in the center. 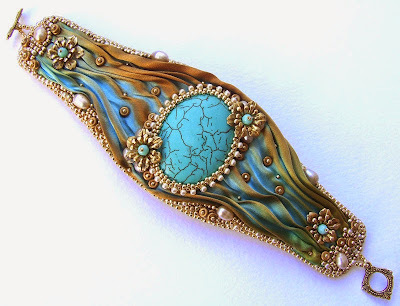 To create some of these jewelry styles, check out these tutorials and inspiration projects! The purples don't quite match the radiance of this year's leading color, but you get the idea! What do you think of the new Pantone line up? Which colors say ‘fall’ the most? 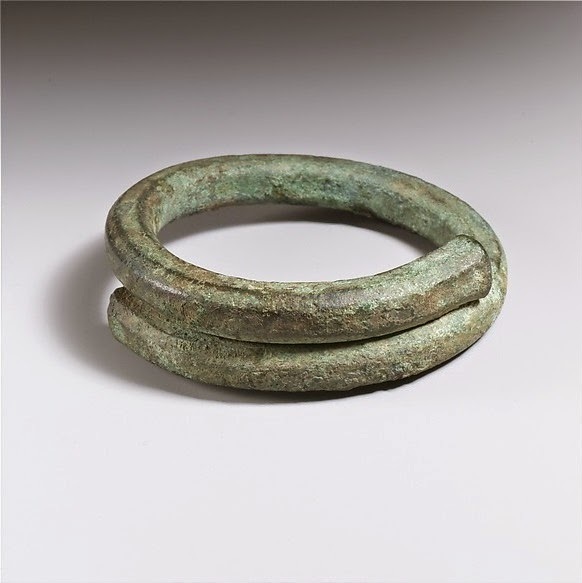 While researching some ancient jewelry styles at The Met, I discovered a lot of bangles that are elegantly simple. 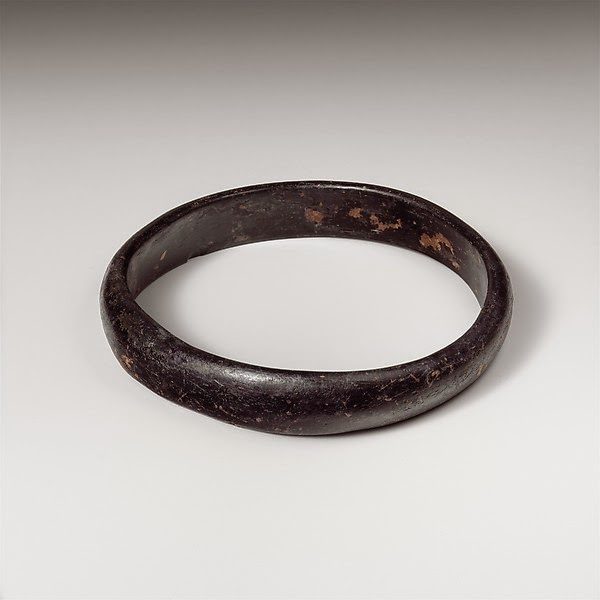 The Metropolitan Museum’s collection of ancient bangles in glass or metal is quite large – some of them have really interesting designs, while others are very plain. 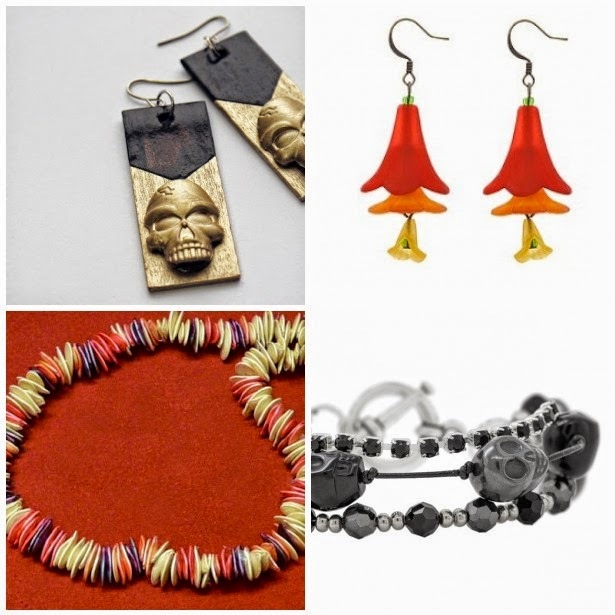 There was a probably a lot more work put into creating these accessories than something similar you’d find in a shop today – just getting the metals would have been a feat – but they don’t have much of an oooh factor. 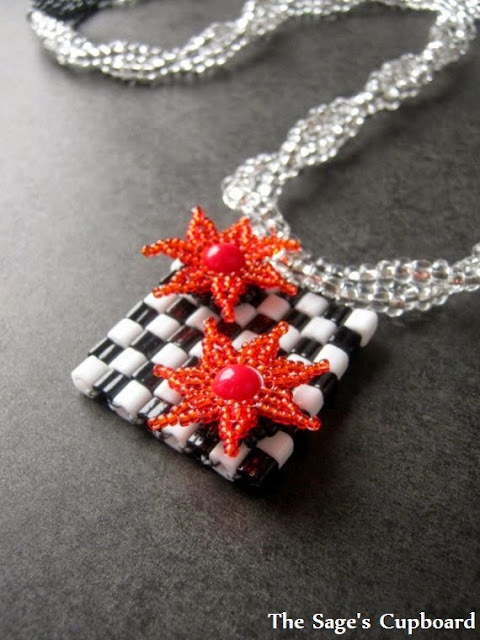 I think they definitely make one appreciate the variety and unique style that beadwork affords us. What's your favorite style of no-frills jewelry? I’ve been so busy working on top secret projects these past few months, that I haven’t had any true works in progress to share. It is kind of fun to look at a piece I’m working on just as the beads – I’m looking forward to comparing all of these snapshots to the finished work when it’s all complete. I’m going to do my best to squeeze in a side project or two so I can share a little beadwork as well. Right now I’m working with a really fun combination of turquoise blue and lemon yellow, plus black and white Rizos. I’ve had a lot of opportunities to work with Rizos lately, and they are incredibly versatile – much more so than regular drops. The small ends make them perfect for accents that replace other seed beads, and the long shape is really elegant in all kinds of fringe. As soon as this project is complete, I’m embarking on a fantastic collar adventure. My African Christmas beads are washed and set out to dry right now. Can’t wait! Sometimes bad news can also be good news, if you look at it the right way. It’s always a bit amusing to ponder whether or not making it into the finals for the Ugly Necklace Contest would truly be a good thing. Perhaps it’s great to be incapable of making something truly hideous. This year’s finalists were recently chosen, though they won’t be unveiled until later this fall. 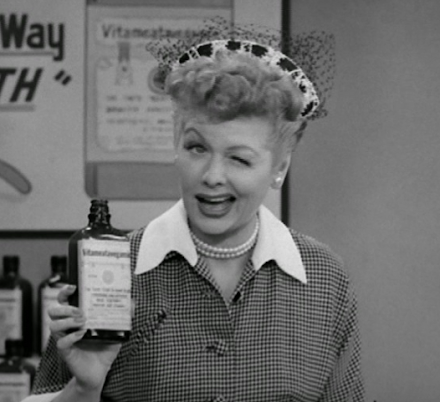 I had really hoped that my concoction would make it into the voting round this year, so I'm a little disappointed. It was definitely a thrill to learn that I made it into the first draft - a little farther than last time. I’ll need to go back to the drawing board and think of ways to layer on even more ugly for the next contest. For the 2014 Ugly Necklace Contest, artists were asked to include two strands in their piece, along with at least 75% beads overall. This worked out really well for the design that I had started planning long before the new rules were announced. Keeping with my favorite practice of pouring a lot of my unfinished projects and leftover scraps into my Ugly Necklace entry, I decided to use a pair of beaded doll dresses that I had experimented with. I had a brief phase where I really wanted to make non-wearable beadwork, and I thought tiny clothes would be a fun place to start. The beadwork turned out great, but the dress designs definitely did not. Since the dresses were so ugly to start with, I thought they’d make a great contribution to my entry. I also wanted to find a way to include as many of my leftover bead baggies as I could. After so many years of beading, I had a huge collection of them. What better way to use them up? I thought Ugly Stepsisters would make a great name for my necklace, so I reinforced and decorated the bead bags with magazine cut-outs of eyes, lips, and shoes to give it a Cinderella theme. Bringing that particular section together was a lot of work, especially stitching through it, but it was totally worth it. To complete the strands, I incorporated some herringbone rope, leftover bead mixes, recycled sari silk, cotton cord, and some of my least favorite beads. Voting for the world’s ugliest necklace begins in early November, through December 15th, 2014. 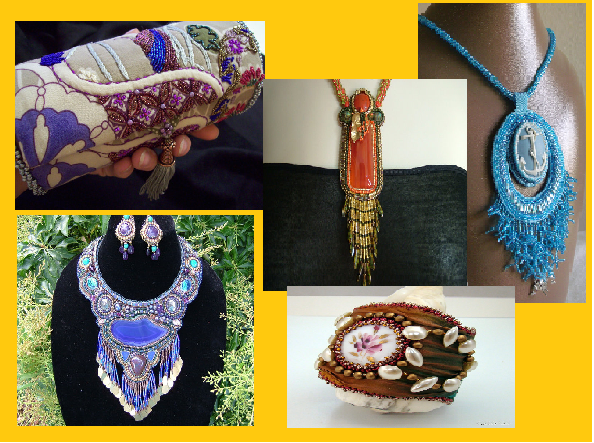 Check out Land of Odds to see previous winners, or learn more about entering a piece in the next International Ugly Necklace Contest. I promise you'll have a blast! It’s that time of year again, when all of our thoughts turn to pumpkins, ghosts, and bats. One of the best things about the beading craft is how well our materials can convert to holiday themed designs, just by mixing the right elements and color palettes. 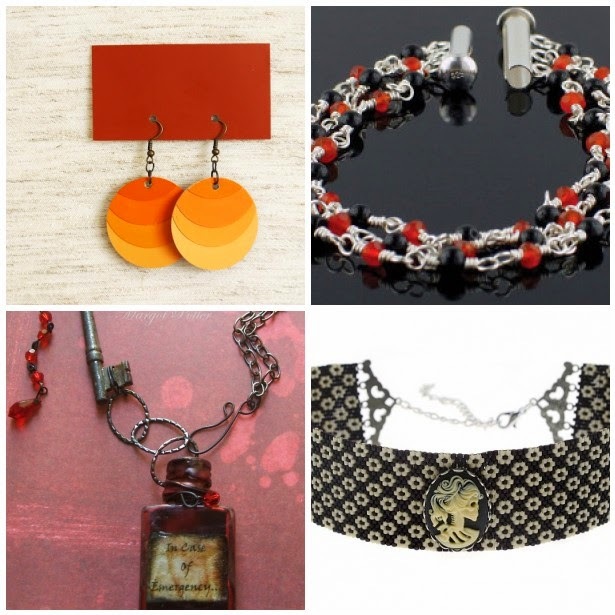 Round orange beads can transform easily into pumpkins, red crystals into vampire blood, and stripes into candy corn. The possibilities are endless! 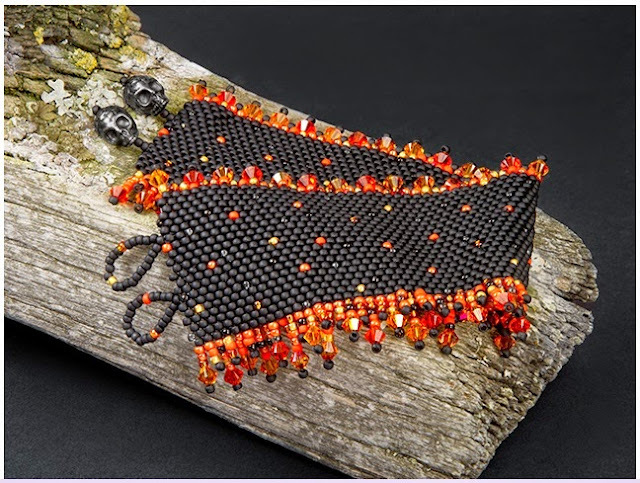 There’s a lot of beadwork and fringe in this Trick or Treat Trail cuff project from Artbeads.com. The crystal trim really stands out against a black peyote stitch base. 1. These Orange Ombre Paint Chip Earrings from Minted Strawberry are a easy to make, and require only a few simple tools. Plus, the palette can be adapted to any style you choose. 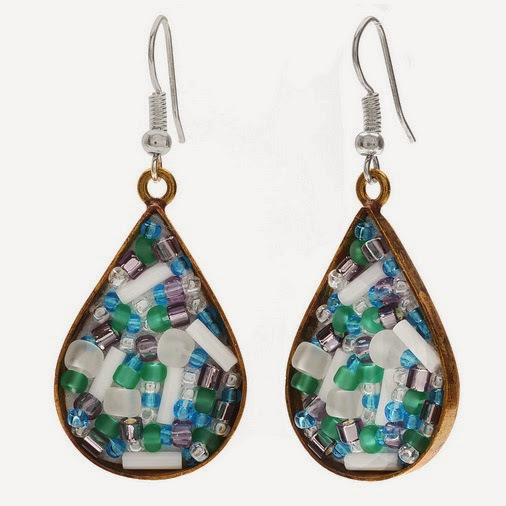 showcases the beauty of simple glass beads in a very festive palette. 3. Margot Potter takes the potion necklace to a whole new level with her vampire In Case of Emergency mixed media project. For a fast version, try My So Called Crafty Life’s Mini Apothecary Jar Necklace tutorial. Also check out Margot’s Crystal Web Collar necklace project for a great October statement piece. 4. Cameos and peyote patterns combine in this elegant and spooky Colette’s Choker tutorial from Beadaholique. Skull Earrings started out as tongue depressors? All they need are some ruby red flatbacks! from Auntie’s Beads will satisfy your cravings for orange. dying and stringing your own fresh pumpkin seed necklace. 4. 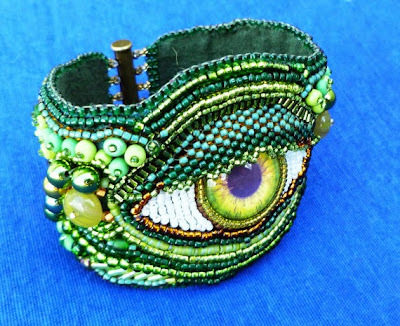 This Edge of Darkness Bracelet project from FusionBeads.com is beadiful and spooky. Too grim? A touch of red, purple, or green would make it really pop. I’m feeling a little rushed again this week, still working out a routine that includes school, work, beading, writing and a little R&R when I can snag it. The good news is that I’ve been getting a lot of great beading done. Right now I’m finally getting to work with some of the new bugles I added to my stash a few months ago, using an old favorite design. It’s all very comforting, which is definitely something I need right now. I’ve also been experimenting with some new stringing material. I’ve been wearing a quick prototype necklace that I made for a couple of months, and the results have been great. I decided it was time to combine the new cord with my white-hearts, and had a lot of fun just stringing. The necklace turned out so gorgeous, I’ve decided I just want to keep it for myself. It’s been a long time since I’ve done that, and it feels pretty good.